How did Elizabeth I stabilize England after centuries of political turmoil? 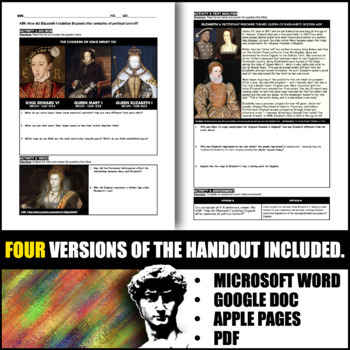 ACTIVITY 1 -- DO NOW: Students will analyze three portraits of Henry VIII's children, Edward VI, Mary I, and Elizabeth I, and make inferences about their reigns based on their portraits. ACTIVITY 2 -- TEXT ANALYSIS: Students will read about the time between Henry VIII's accession and Elizabeth's accession to the throne to determine the causes and effects of the religious turmoil in-between. ACTIVITY 3 -- THINK-PAIR-SHARE (POWERPOINT INCLUDED): Students can work in pairs or individually to analyze three problems England faced in the 16th century. The problems they will analyze are religious intolerance, the Spanish Armada, and theatre/freedom of speech. For each problem, students must create a solution. 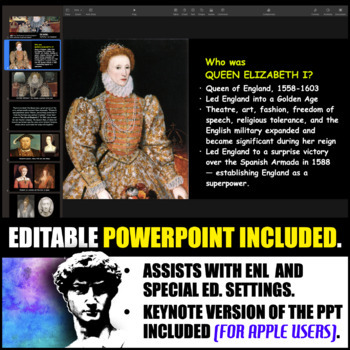 Then, with the aide of the powerpoint, students will assess how Elizabeth I solved each problem. 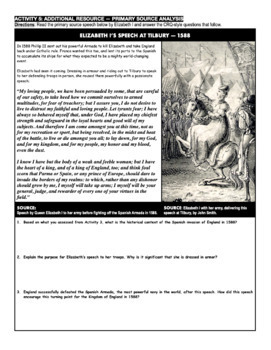 ACTIVITY 4 -- PRIMARY SOURCE ANALYSIS: Students will analyze a primary account of Elizabeth I's speech at Tilbury where she arrived in armor and spoke to crowds before sending them to fight the Spanish. ASSESSMENT: Students may complete Activity 4 for an assessment grade, or answer the AIM using the R.A.C.E.S. format (FREE Download Here). 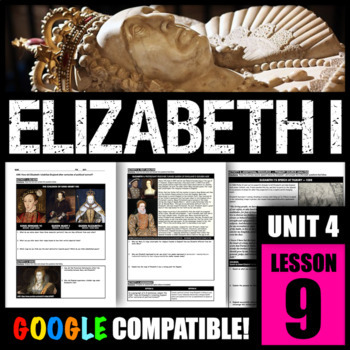 ADDITIONAL RESOURCE INCLUDED: PowerPoint with photos of Elizabeth's portraits from her time as a princess to an aging queen. PowerPoint is essential for Activity 3.